Pneumadyne supplies 7-station brass pneumatic manifolds, giving users a convenient junction point for distributing gases, fluids, and liquids to multiple outputs from a single source. 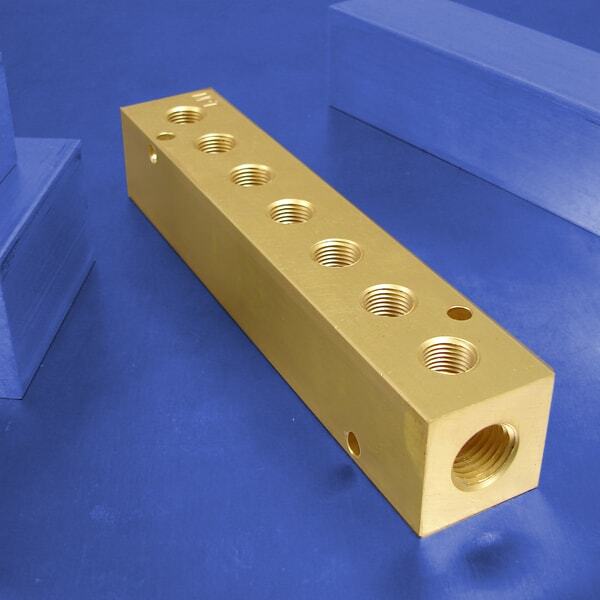 Our brass manifolds can be used with hydraulic fluids, air, and water. They are pressure-rated to 2,000 psi. These 7-station pneumatic manifolds are precision machined from durable, corrosion/chemical resistant brass for years of reliable performance. Threaded ports allow for fast and easy connections; two sets of mounting holes provide installation versatility. Available in 1/4 NPT and 3/8 NPT input sizes. Order the brass 7-station pneumatic manifolds you need today. Contact Pneumadyne to learn more.